If you are familiar with Extensible Stylesheet Language Transformations (XSLT) code you can use the CustomXsltCode option from the Visual Mapper palette to enrich the transformation using expressions. This option is useful if you are an XSLT code expert and if the existing functions do not meet your use cases. 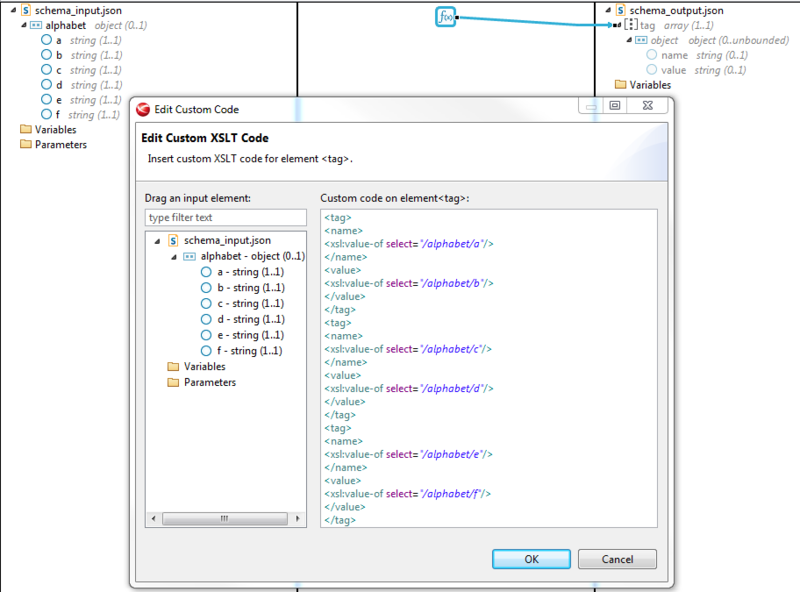 Add the CustomXsltCode from the context menu (from Set function -> Custom code -> CustomXsltCode). Note If the CustomXsltCode is placed on a record, all its children are grayed out and cannot be linked. Use the context menu (right-click on the Custom XSLT box and select Edit). Caution You are responsible for the validity of this custom code; therefore, it is neccessary to simulate the created map before you run it on the server.